The international community and the secretary general of the U.N. must explain why they are not calling out irregularities in the elections in the Democratic Republic of the Congo (DRC), instead of just saying that things are going relatively well – or pretending to ignore this election in the world’s most resource rich nation, with the world’s lowest standard of living and the highest death toll due to armed conflict since World War II. 1) There were fictitious polling stations, polling stations with no ballots, polling stations stuffed with advance ballots previously checked with the name of incumbent President Joseph Kabila. 2) Ballots were stored by private individuals in their houses, instead of guarded official sites. This meant they could be filled out before they were delivered to the polls. 3) The names of many registered voters were not included on the lists. 4) State security forces attacked, wounded and killed civilians. These are deliberate efforts to maintain the system for plundering Congo’s wealth instead of using it to improve the lives of Congolese people. What is the real mandate of MONUSCO, the U.N. mission in Congo? This system for plundering Congo was described in detail in the U.N. Report of the Panel of Experts on the Illegal Exploitation of Natural Resources and Other Forms of Wealth of the Democratic Republic of the Congo, 2001 , 2002 , 2003  and 2008 . However, MONUSCO, the United Nations Organization Stabilization Mission in the Democratic Republic of the Congo , remains in Congo, with U.N. troops but without disrupting, much less eliminating, the system of plunder. Indeed, this year, a North Kivu judge sentenced a MONUSCO driver and his accomplice to three years in prison and a $25,000 fine after they were arrested attempting to cross the Congolese border into Rwanda with 1,200 kilograms of the mineral cassiterite. MONUSCO spokesman Madnodje Mounoubai insisted that this was a singular incident and denied allegations that the U.N. mission is involved in the very plunder they’re supposed to be there to prevent. However, Congo Planet pointed out  that this is not the first time MONUSCO peacekeeping troops have been caught smuggling minerals and that they have even been accused of dealing weapons to militias smuggling minerals. Congo Planet called for MONUSCO to subject its own vehicles to inspection at Congolese border crossings. Why would anyone now expect the same MONUSCO to be working to support a free and fair election in Congo, especially if a candidate chosen by the people might finally mount a real effort to end the plunder and restore Congolese resources to the Congolese people? Ending the plunder would be a daunting task, given the well established criminal networks described in the U.N. reports and given the huge markets for smuggled minerals. But is there any reason to think that MONUSCO would want the Congolese to elect a president committed to stopping the plunder or that MONUSCO would help such a president? There is a clear parallel between the 2006 and 2011 presidential elections. In 2006, the U.N. Mission in Congo was called MONUC, the United Nations Organization Mission in the Democratic Republic of the Congo, before its name was changed to MONUSCO, in 2010. MONUC was led by former U.S. Ambassador to the DRC William Lacey Swing , who had a very controversial record. And the 2006 election was not free and not fair, though that was not the story sold to the world. In 2011, MONUSCO is headed by another former U.S. ambassador to the DRC, Roger Meece. And, once again, the country is confronted with election chaos, including shootings, beatings and tear gas of an opposition candidate’s political supporters. Can anyone explain this? Why are former U.S. diplomats appointed to head the U.N. Mission in Congo? Is it a coincidence or a rule? How does he, Secretary General Ban Ki-Moon, explain the electoral chaos in the Democratic Republic of the Congo, despite nearly $9 billion U.N. dollars spent on MONUC and then MONUSCO since 1999 ? How does he explain the ballots so obviously transported and distributed by CENI (Independent National Congolese Electoral Commission) and, in some cases, by MONUSCO, that ended up in private rather than official hands? How much credibility can the U.N. have when its staff is involved in plundering the country with the lowest standard of living in the world? 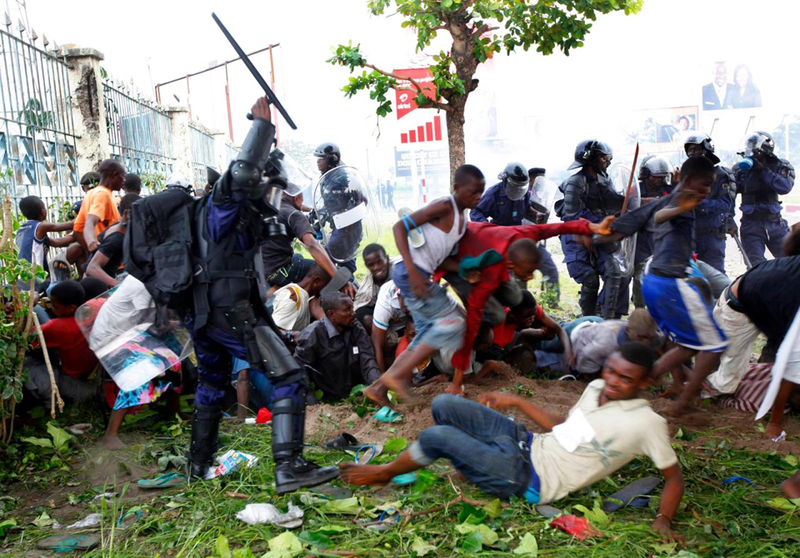 The Congolese population is overwhelmingly rejecting President Joseph Kabila, not only because he failed to repair or build new Congolese infrastructure or improve their standard of living in 10 years’ time, but also because he failed to stop the plunder. Nevertheless, Kabila is enjoying the support of foreign heads of state and the international business community. They are expected to make every effort to keep him in power, even though there can be no credibility to an announcement that he has won. The Carter Center’s election monitoring mission wrote, “It was evident to observers that large numbers of Congolese voters were determined to exercise their fundamental political rights.” That determination has been far beyond anything the world expected. 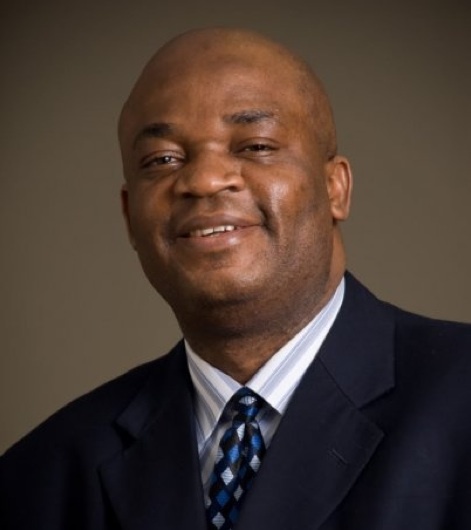 Congolese-born Congolese-American Eric Kamba, the author, says that he cannot safely return home so long as Joseph Kabila is in power. On Nov. 30, the New York Times reported that initial results were showing opposition candidate Étienne Tshisikedi leading 3 to 1 in the country’s capital and largest city, Kinshasa, but that the national electoral commission, headed by a friend of President Joseph Kabila, is threatening to disqualify tens of thousands of opposition votes. 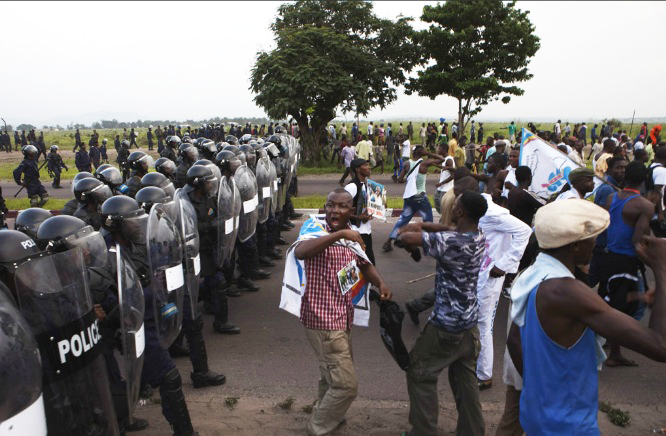 Courageous and determined Congolese people are saying, “No, enough is enough. Change has come to Congo. 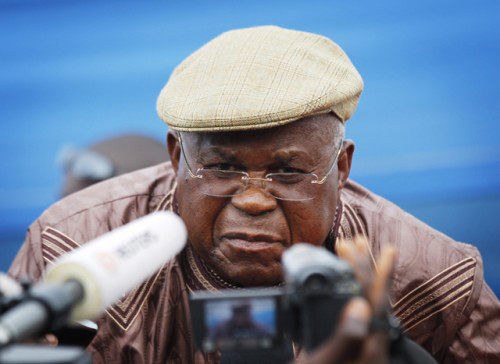 We want President Tshisikedi,” and the rest of the world should stand with them. A phone call from Barack Obama to Joseph Kabila saying, “It’s over; you lost; time to step down,” could probably stop a bloodbath in the heart of Africa. 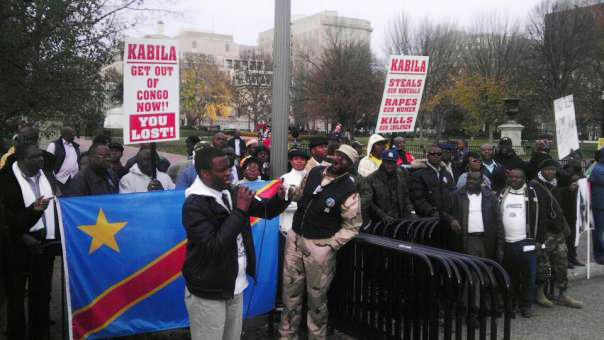 Eric demonstrates outside the White House with other members of the Congolese diaspora in the U.S. on Nov. 27. Agence France Presse reports from the DRC Nov. 27.